Buy Nature's Charm Sweetened Condensed Coconut Milk - 320g in the UK from our online shop or directly from our independent Scottish store. 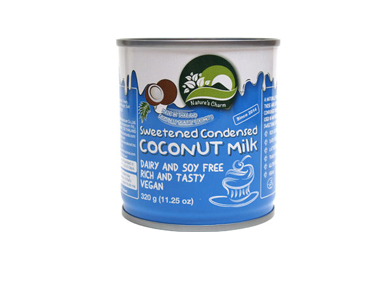 This dairy free condensed milk is made from coconut milk and is dairy free, soy free and gluten free. Rich and tasty and a good source of calcium. Suitable for vegans. This condensed milk is a dairy free alternative to normal condensed milk. It is derived from coconut and a good source of calcium. You can use all sorts of berries for this recipe, like strawberries, red or black currants, brambles or blackberries, blueberies, honeyberries. You can also use frozen berries. This recipe contains 1 tin condensed coconut milk. Although this vegan pie takes 1.5 hours to make (plus 2 hours to set), it really is worth the effort. Velvety smooth pumpkin filling on top of a gluten free base made with pecan nuts and maple syrup. This recipe contains 160g condensed coconut milk. We sell real Nature's Charm and other Coconut Based Ingredients directly from our shop in Scotland and online throughout the UK. View more products from Nature's Charm. Where can you buy real Coconut Condensed Milk safely online? If you are wondering where you can buy Nature's Charm Sweetened Condensed Coconut Milk - 320g safely online in the UK, then shop with us. We are an actual health foods shop; with real people selling real foods and products. Our award-winning independent shop is located in Stirling, Scotland since 1976. You can buy our Coconut Based Ingredients in store or safely place an order with us online or over the phone. Coconut Condensed Milk - Nature's Charm Sweetened Condensed Coconut Milk - 320g in Coconut Based Ingredients and Miscelanious Ingredients.